Yesterday morning, I drove down to Roanoke, Virginia, for my first Virginia Association of School Librarians annual conference. My school was happy to support my attendance and I can use all the help I can get with ideas on how to run my library better. And boy howdy have I gotten a LOT of ideas. I probably could have attended last year, but I was so overwhelmed by the newness of everything last year that I didn't even think about VAASL for quite awhile. Thinking about it now, I'm actually glad I didn't attend. I would likely have gotten even more overwhelmed! Attending for the first time as a second year school librarian gives me a good perspective. I know where my weaknesses are, and my strengths. I know what I do know and what I don't. I know a little bit more of what my library needs and what my student and teacher population needs. Having gotten to know my library over the last year has given me a good base to work with this year as I choose what sessions might be the most beneficial to me. And, instead of getting all worked up that I'll never be good enough and make my library the best ever, I'm getting excited about what I will be working on when I get back! What I don't get to do will be okay. Whenever my time to move on comes, I will leave the library a better place than how I found it and that's what really matters. I also learned today that I forgot to pack socks. I know I set them out somewhere to put in my bag, but I certainly couldn't find them this morning. 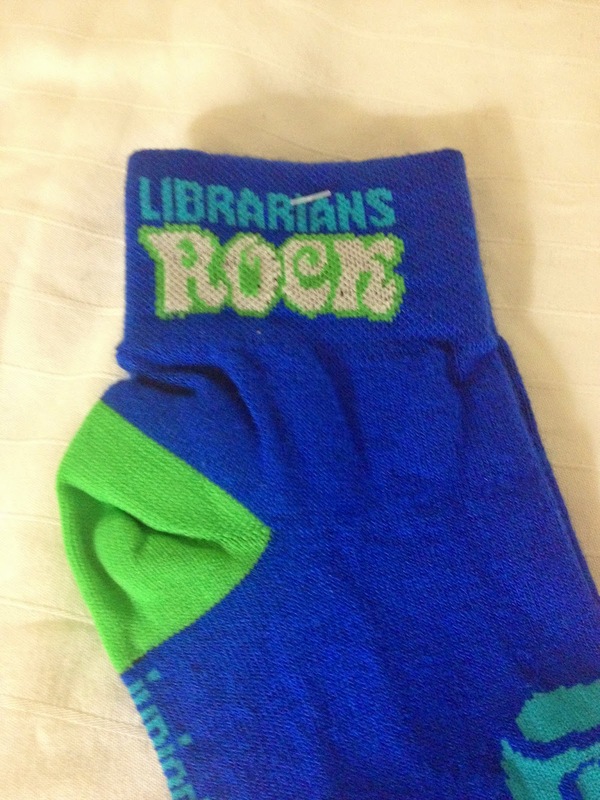 Fortunately, in my swag bag at the First Timers Breakfast, I received a brand new pair of socks. They won't match my ensemble tomorrow at all, but at least they'll be clean! I don't know that I went to the conference for my teaching job my first year either or not. But I know I thoroughly enjoyed it every year I did go. Despite the fact that there were never any socks in my goody bag. More conferences need to hand out goody bags. I can hardly wait for my symposium in San Antonio--I always learn something from these men and women, even if I'll never have their jobs! Conferences are always interesting!